Remember those days when you were a kid, riding around on a scooter all around town? Those were the good old days. 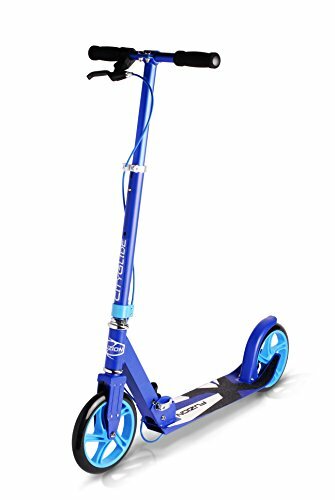 It would be so nice if someone invented a scooter that worked for adults. Well, the Fuzion Cityglide B200 is just that! A perfectly compact scooter means to carry up to 220 pounds. These scooters have everything you need to cruise around and have fun like you used to. Sometimes it can be frustrating to go outside and see all these kids having fun on scooters like you used to, but for some reason, society tells us we can’t. Why? Nobody knows! Finally, a company has come to their senses and made an awesome version for the people who are investing in their products in the first place! Adult scooters are fairly new, but with new products comes little glitches and issues that need to be fixed. Fuzion stuck with it and made a better model with each try. After all kinds of research and technological advancements, they have produced the Fuzion Cityglide B200. The B200 is a scooter perfect for adults in every way. It has the right base platform size, wheel size, and a dual brake system to allow you to choose how you want to slow down. When we first started jumping into the world of adult scooters, there were hundreds of different options. We didn’t know which one was the best, and we didn’t want to leave that burden on your shoulders. After searching all over the internet through blogs, YouTube, and customer reviews, we came across the Fuzion Cityglide B200. People love this scooter, so we’re excited to share it with you! One of the biggest issues with any scooter, whether it’s for an adult or kid, is the braking system. Most scooters only have the rear wheel brake or none at all. Without a braking system, you’re relying 100% on your foot stopping your acceleration. Not only is this incredibly dangerous, but it can tear apart your shoe very quickly. Even having just one rear braking system can make it difficult because most of us don’t think to stomp on the back tire when we want to slow down. The good news is that the Cityglide B200 comes with two different braking systems which make it 100 times easier for you to slow down or stop. The first braking system is on the handlebars. All you have to do it squeeze the brake handle and you’ll stop, much like a bicycle braking system. If you prefer the rear wheel brake system, they also included that for those of us who remember riding the classic scooters when we were young! Whichever method you choose, peace of mind is always important. You should never have to rely on using your shoe to slow you down because it’s never quite good enough and ruins your shoe in the process. Why buy one product that’s going to make you replace another in the near future? You don’t have to worry anymore about braking issues with the B200. Pretty much all scooters come with the standard hardened plastic wheels that we all know so well. They’re good for concrete and asphalt, but the list stops there. What about riding on grass and dirt? It’s unfortunate that the fun has to stop the second you hit the lawn, a grass, or some dirt. This is the 21st century, since when does a little dirt stop us? The Fuzion Cityglide B200 went ahead of the pack and made massive all-terrain wheels that immediately fixed this issue. Ride over dirt, grass, concrete, and asphalt all without hardly being able to tell a difference. It’s about time a little dirt and grass didn’t stop us! These wheels are thick enough and tall enough to make the ride a little smoother than most other off-road action sports vehicles too. The size of these wheels also helps with traction, which can end up being an issue with most other scooters in slippery situations like rain or water spills. Turning sharply also ended with the rider falling off on the older scooters, but that’s no longer an issue with the B200’s high-traction wheels. The frame of this adult scooter is made of aluminum. Aluminum is well-known for being incredibly durable while remaining very lightweight. It makes for an easy carrying process when you have to fold it up and put it away or take it out. Lightweight aluminum also means that you get a smoother ride since there’s less weight put directly on the tires. Since aluminum is so strong, the Cityglide B200 can support up to 220 pounds of weight. This means that most adults would have no problem cruising around on the B200, unlike many other adult scooters. 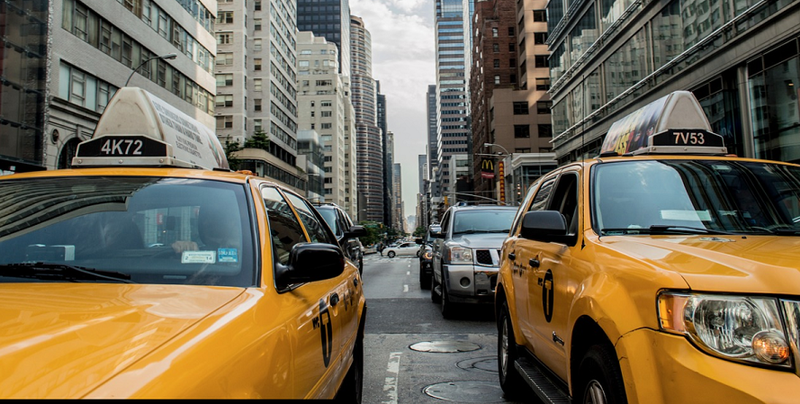 Most other brands cap off around 150 to 180 pounds, which cuts out a large chunk of the world’s population. When making a product for adults, it should support the adult weight! Fuzion saw this issue and made it happen with aluminum in the frame. + Supports people of all sizes. While most other brands who produce adult scooters limit their weight far too low, the Fuzion Cityglide B200 supports almost any adult. This is an important feature when they’re trying to target all consumers. 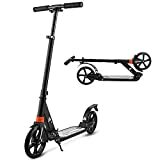 + Large all-terrain wheels help you push through any situation which might otherwise block you from riding around on your adult scooter. Instead of people stopped by grass or dirt, glide right over it like a breeze. + The double braking system on this scooter lets you choose which way you want to brake without limiting you to one choice. Don’t ruin your shoes or miss the brake because of how poorly it’s placed, the B200 gives you twice the options for twice the safety. 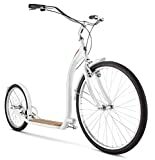 + Aluminum scooters like this one are lightweight and durable in nature, which provides many benefits in the construction of this scooter. Not only is it easy to carry around and fold up, but it provides a smoother ride and a higher weight capacity. On top of that, you don’t have to worry about breaking it if you happen to drop it. – Some people don’t like the back wheel brake because it doesn’t provide a quick enough stopping power. However, the front handlebar break is more than enough to slow down and stop the scooter without having to ever use the rear brake. You can always depend on the rear braking system as a backup as well. – Although 220 pounds is a pretty high weight limit, there are still a lot of people who might not fit on the scooter because of it. Fuzion is constantly working to raise the weight limit and increase the number of consumers who can use their products, so stay tuned! The Fuzion Cityglide B200 is suitable for anyone looking to have a good time. That is 100% what having an adult scooter is all about. It’s not to use for long-term transportation, although you can definitely use it for that. It’s just meant to have some serious fun like we all used to be able to do when we were kids. If you read reviews or watch videos of people using the B200, the people in them are always having fun and smiling. Sometimes with all the controversy and difficult times of adulthood, we all just need a little break. Ever wonder why kids don’t stress out over big things so much? It’s because they allow themselves to relax and have a blast! Adult scooters are definitely a step in the right direction, and they’re certainly a fun way to go about it. We don’t just like this adult scooter, we love it! It’s the perfect way to relax after a long day at work or to just have some fun on the weekend. Having an adult scooter is also a perfect centerpiece for conversation, and it’s sure to lighten the mood. After all, having a scooter meant for adults definitely shows that you’re not uptight! Anyone who has one of these knows how important it is to get back to their roots and enjoy the simple things in life. With adult scooters getting more and more popular, seeing the small advancements here and there is also a nice touch. While weight capacities and platform length are still some small issues, companies like Fuzion are constantly working to improve these problems to make adult scooters even more accessible to the general public, like the Xootr scooter. Little added bits like a better braking system, durable lightweight construction, and larger off-road tires are making adult scooters much more popular. With so little limitations, it’s no surprise that more and more people are looking for scooters to blow off some steam and relax a little. We absolutely love the youthfulness and fun provided by the Fuzion Cityglide B200, so when we first came across it, we knew it was the perfect item to share!